Many people ask me about my background - how I got started in the martial arts, how I learned, and who taught me. So at this time I will discuss a little more about my martial arts life and some of the many wonderful people that I grew with in the martial arts. I have a deep respect for all martial artists who hold on so steadfastly to their art. It is not easy to devote your life to the martial arts. They demand much from your abilities and more is asked of you as the years pass. This is not to say that it is a burden for it is far from that. The arts bring me sheer pleasure. The levels keep going higher and higher. There seems to be no end in sight during this lifetime to master all I have been taught. But most of all I have found great pleasure in the people I have met along the way - names like Chuck Norris, Mike Stone, Gary Alexander, Allen Lee, Sidney Austin, Aaron Banks, Edward Parker, and so many more who I met during the so-called "tournament years" in New York City. Some became close friends with whom I still share my life. Others have moved on and are very well known today in the martial arts world, as well as in the movies. There is a special place in the hearts of martial artists for fellow martial artists. It seems we all love the same thing so intensely. For this reason we refer to each other as true brothers, and there is a great respect for each other's efforts in attaining the skills and knowledge which each of us possesses. We each have a special understanding which beginners in the martial arts cannot understand. It is an unspoken understanding that we see in each other's eyes. It is a feeling of love for an art that only those who are deeply involved can understand. With the passing years our love for the art grows, and we all receive great joy when we find people who wish to learn what we have learned. This is the greatest of gifts - knowing that we can share this wondrous adventure with others who wish to learn our cherished art. One such person I would like to speak about is neither Chinese nor is he a teacher of mine. He is a man I grew up with in the arts . 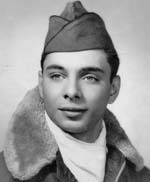 His name is Hanshi Ralph Vergalitto. He is 70 years old and a Japanese Karate player. His name may not be known in the Chinese circles but he is known among his Japanese peers. Our paths crossed in our early years . He was as devoted to his style of Karate as I was to my Shao-lin. You may think these two arts come from different worlds, but that is far from the truth. The deepest secrets of martial arts have little to do with styles or systems. Hanshi Ralph speaks with a distinct New York accent but I cannot tell you if he was born there, because Ralph and I have rarely spoken about our personal lives. We only discussed martial arts when we were together. It was our shared interest. We would spend hours talking about old martial arts war stories, or techniques, or concepts of strategy in free fighting. We never seemed to run out of conversations when it came to the martial arts. One thing would lead to the next and the discussions and demonstrations would go on through the evening. 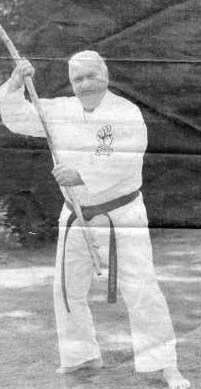 Hanshi Vergalitto's style is Goju Karate. He was recently inducted into the Karate Hall of Fame. 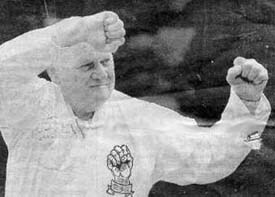 In 1998 he was also inducted into the United Karate Hall of Fame based in New London. Hanshi Vergalitto was and still is a great professor of his heritage, and he has shown nothing but respect for his teachers. He has not been concerned with changing his style, but rather with increasing his knowledge of it. He loved comparing my style with his and with the varying concepts of fighting which each style professed. We would spend much time showing each other our favorite forms or techniques. There were no secrets between us. We both knew that we each loved our own art. We were just comparing and learning from these comparisons. It was a time of growing for the both of us. We started out at as new teachers of our respective styles at about the same time. Ralph had his students and I had mine. We would meet after our classes and spend hours teaching each other and exchanging our viewpoints and teaching methods. Over the years we never lost contact with each other. If I did not call him he would call me to see how I was doing. A martial arts friendship can last a lifetime. Hanshi Vergalitto comes from the old schools of training, when martial arts were fairly young in this country. Training was so much different then. The teachers were tougher and the fighting and physical contact were fearsome. The first tournaments were battlegrounds for the newly trained fighters of the day. Physical contact was a common occurrence and many people were seriously hurt in the early years. It was only after the I.C.M.A. (International Convention of the Martial Arts) convention when rules were laid out about how to run a tournament safely. This was where I met Hanshi Vergalitto, when we were both ready for the action of the hot and heavy tournament competition. It was not uncommon to see each of us banged up with broken ribs or arms, eye injuries, sprains, or bruises. Compare this with today's training where there is little or no contact. Hanshi Vergalitto brought this point up in a recent newspaper article about him where he said, "Students today are learning the martial arts in a softer way." He went on, "Back then when you were about to hit another student one would stop roughly an inch away; presently a student would stop about a foot away. This is giving a student a false sense of security....You learn something that you hope you never have to use, but the more proficient you get, the more deadly you get." Today lawsuits scare teachers away from really showing a student how to dish it out and take it in when it comes to fighting. Students of today seem to want to be great at a martial art but also don't want to get hurt while learning it. There is a totally different type of person with a different attitude among students these days. The old timers such as Hanshi Ralph seem to be a diminishing breed. This is not to put down today's students, because, thankfully, there still are some who want the old training and who have what it takes to be great fighters and stylists. There are just fewer of them today. Hanshi Vergalitto said, "I love to see the development of students - taking a student who doesn't know anything and developing him into a Karate-Ka. It takes a long time to learn, because it is an Art and you've got to believe in it." The old timers don't just fade away, they linger until their dying days, doing what they love the best, Martial Arts. I have few, if any, so-called personal friends in my life. All the people I know are in some way connected to my martial arts life. It is not that we martial artists don't like making personal friends, it is just that we spend most if not all of our free time in the training halls. Our so-called free time is often spent with follow students or teachers and people who share a martial arts interest. For practitioners of this art there seems to be little time or interest in anything else but the study of martial arts. When we are not doing the art, we are reading about it, when we are not reading about it, we are writing about it, when we are not writing about it, we are thinking about it. This leaves little time for anything else. To do this requires the love and belief in the underlying principles of this art, which is self-cultivation and spiritual fulfillment. One thing that has never changed is the fact that once a person trains in a martial art for some time, it will remain in the memory for the rest of one's life. The training is so profound and enriching that the experience stays with you forever. No matter what level of skill you achieve, or even if you drop out of the arts, you will never forget the arts. The people you meet, the experiences you encounter, all burn deeply into your memory. For me one such person is Hanshi Vegaleto. We are brothers till the end and maybe even beyond.